If you’ve ever wandered through a casino and envied all those people crowded around a Craps table it’s probably because you’ve always been too nervous to get involved. Admittedly the table can look dispiritingly complicated at first glance and it’s also advisable to learn the rules before you try it out but the learning process is quick – there’s a simple guide right here. Complement that guide by playing online and you’ll be a Craps player before you know it; this Microgaming version is called Vegas Craps and it’s ideal for beginners and more advanced players. The Shooter rolls two dice to establish the Point – one of the numbers 4, 5, 6, 8, 9, and 10. Any other number results in a bet win or loss. Once the Point is established the dice are thrown until either that Point number is rolled (you win) or a seven is rolled (you lose). In this online version you are of course the Shooter; begin by placing a bet on the Pass Line or Don’t Pass Bar and then press the ‘Roll’ button. Your first throw will establish the Point or not; when the Point has been established just keep rolling the dice until you win by matching the Point or you lose by rolling a seven. That’s all there is to the basic game but of course a brief glance at the table will tell you that there are plenty more complex betting options. You can read more about these in our Craps guide. 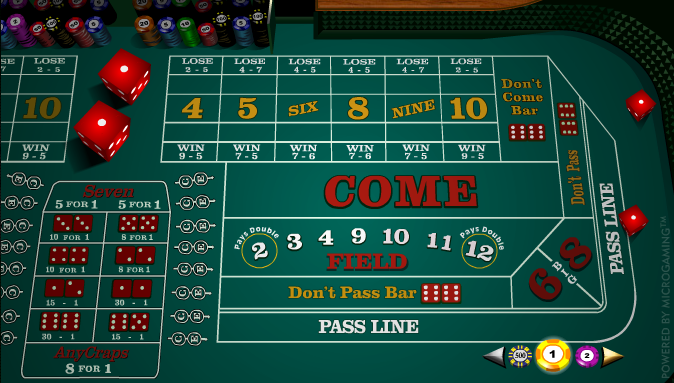 Vegas Craps is an ideal way to dip a toe into the world of this interesting dice game; it features all the aspects of the casino version (except the excitable crowd), some nice graphics and an RTP of 98.64% if you follow Craps strategy.